Renews shine and wax protection in minutes! A clean boat is only minutes away thanks to Marine 31 Gel Coat Wax & Shine Detail Spray! A few quick sprays will safely remove fresh water spots, salt spray, boat scum and mineral deposits, leaving your boat looking like you just spent hours detailing it. High-grade Carnauba wax imparts a high-gloss, slick finish that resists future soiling and staining, keeping your boat cleaner in between washes. Not all marine quick detail sprays are created equal! 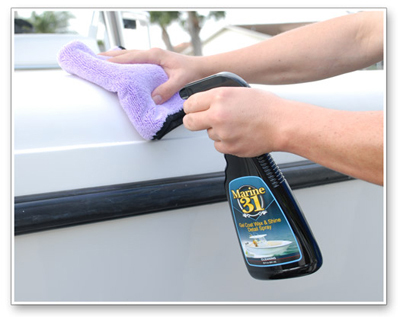 Like other Marine 31 boat care products, Gel Coat Wax & Shine Detail Spray was developed right here in south Florida. You’ll be impressed with its ease of use, even in direct sunlight! Marine 31 Gel Coat Wax & Shine Detail Spray doesn’t streak, smear or haze; it wipes off without any effort to reveal a high-gloss, slick finish. Use Marine 31 Gel Coat Wax & Shine Detail Spray as often as you wish. If your boat is already clean and you wish to take the shine up a notch, one or two sprays is all you need. Marine 31 Gel Coat Wax & Shine Detail Spray is harbor-safe and eco-friendly. 2. Working one section at a time, spray a fine mist of product directly onto surface and wipe clean with a microfiber towel. 3. Flip the microfiber towel to a dry side and lightly buff the area. Change to a fresh towel as needed. 4. Repeat steps 1-3 until entire boat is cleaned. 5. To further increase the gloss, slickness and protection, apply a quick coat of Marine 31 Gel Coat Spray Wax Plus.